They say you can't judge a book by its cover. This recycling container looks perfectly sensible, clearly labeled as to what should be thrown into it. But in practice it fails miserably at its intended use, and has been doing so ever since the Princeton Public Library's cafe opened several years ago. A functional recycling container would 1) provide abundant visual cues to the user, and 2) be paired with a trash container. The absence of either of these attributes almost always insures the "recycling" container will get filled with trash. 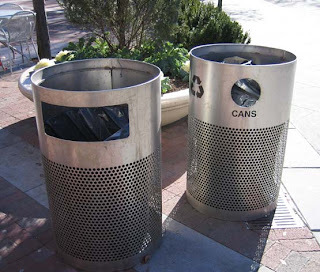 Designers of buildings and plazas typically choose aesthetics over functionality, which often means the trash and recycling containers are both expensive (as much as $1000 each) and stylishly similar in appearance. 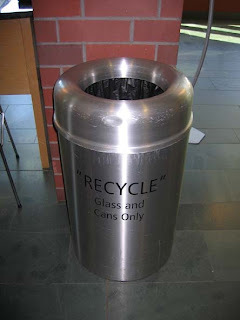 The library cafe's recycling container fails because it is placed far from the trash container and looks just like it (2nd photo). Though the container is labeled, no one stops to read labels, and the container's wide mouth is an invitation for trash. Here you have a high profile public building in a progressive town, no doubt run by people with environmental sympathies, and everything but cardboard is being thrown in the trash dumpster out back. You'd expect institutions like schools and libraries to use recycling as a way to educate children to be good environmental stewards, but my experience has been the opposite. Far from being unusual, this "recycling in name only" is more the rule than the exception in public places, institutions and businesses. Only an extremely persistent volunteer effort was sufficient to get recycling up to speed in Princeton's public schools last year. 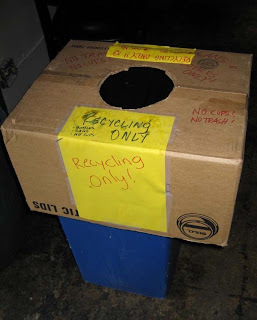 This fall, multiple emails over several months to the library have at last yielded a recognition by the library's management of this and other recycling problems in the building. Princeton township and borough have mandatory recycling ordinances, but these by themselves do not make recycling happen. In the plaza outside the library are some more gleaming containers, sometimes paired. The openings are at least different--for those that still have tops--but there's a good chance that people don't distinguish, and that all contents get carted off to the landfill. It seems such a shame to have all that wonderful solar energy glancing off the sides of the house all winter. If all homes had passive solar designs, we'd be well on our way to solving our share of the global warming crisis. But they're not, so what to do? I cleaned the windows on the south and west sides, and took off the screens, to be as welcoming to the sun as our windows allow. A small gesture, but it's surprising how much heat comes in on a sunny day. One spot that offered greater possibilities was the garage, which, incredible as it may sound, used to be used for storing cars. Because it's located under living space, a cold garage will make for a cooler floor in the rooms above. 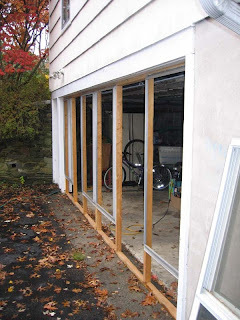 It didn't help that the garage door allowed outside air in freely around its edges. What followed was a long period of cogitation intermingled with what I like to call strategic procrastination. 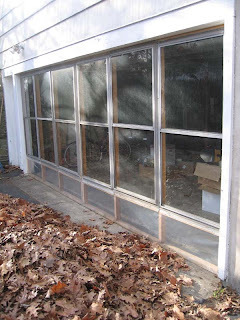 The vague plan gained more momentum and clarity when a friend gave me some old aluminum storm windows. Then, as the sun conveniently began dipping low in the sky to flood the garage with light, some 2X3s got purchased and eventually cut to size, screwed together, and finally fitted with my friend's storm windows. Below is the end result. It cost next to nothing, and can easily be removed during the summer. 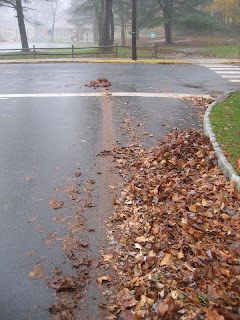 Note the leaf pile, meant to deter incoming cars. Each weekday morning, kids and parents stream down Abernathy Street to get to Little Brook Elementary School. 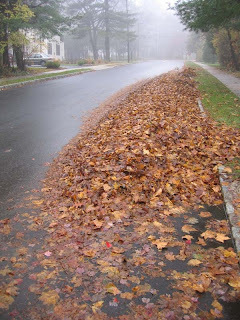 This time of year, leaves on the street make the morning and afternoon rush hours a little more dangerous, as leaves piled on the street constrict traffic flow and turn slippery in the rain. The township, responding to a state mandate, requires that leaves not be put on the street until one week before the monthly pickup, and that the piles extend no more than three feet out from the curb. This pile, a common sight, was set out two weeks before scheduled pickup, and extends ten feet out. As often is the case, this was the work of a landscape crew from out of town that seems oblivious to local regulations. The second photo, dramatizing the hazardous aspect of leaves dumped in the street, gives evidence of a car skidding through a stop sign on rotting leaves, in a busy intersection crowded with kids twice a day. The third photo shows a small victory for sanity. A homeowner who used to have the leaves in her woodlot blown into the street every fall has had a change of heart. 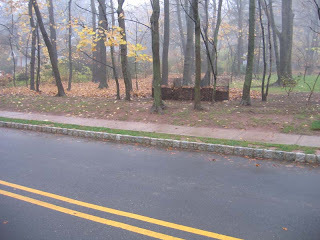 She now piles some in three wire bins, and spreads the rest in a well-defined area under the trees, enriching her soil and leaving the street clean. 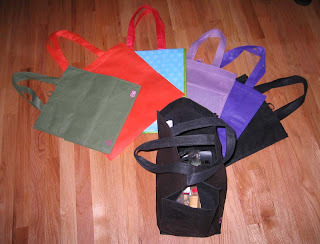 I have consolidated all our cloth grocery bag holdings, which have maintained their size and number despite the shrinking stock market. Seven, all told, with rumors of others floating around--acquired by various family members with good intentions to stem the flow of disposable plastic bags through our hands and into the landfill. Next step is to redistribute the bags to strategic locations--the back seat of the car, the hallway closet--where they stand half a chance of being remembered for the next trip to the grocery store. They work great, I must say, accommodating the groceries nicely, and it feels good to be holding something of quality on the walk back to the car, rather than a flimsy plastic bag that begins its useful life with one foot in the landfill. Funny, though. I've used them only once, otherwise managing to think of them only when I arrive at the checkout counter, when it's too late. It's an appealing idea for the world's greatest consumer nation: save the world by buying more stuff. But the world will only be saved when we change our behavior, and despite our reputation as a highly adaptable species, that seems the hardest task of all. One alternative approach: Stick a few disposable plastic bags in your pocket before going to the grocery store, not to recycle but to reuse, with their final use being as a liner for the trash can under the kitchen sink. This post will evolve over time, as I collect photos of recycling containers. There are beautiful ones that are completely dysfunctional, ugly ones that serve the purpose, and all manner inbetween. Here's one in the latter category, showing off once again the limitless versatility of cardboard in its service to humanity. 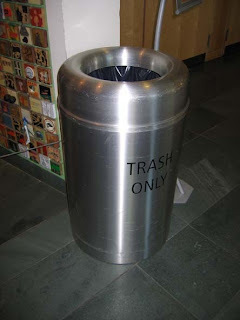 Have a wide-mouthed trash can that you want to convert so people will only throw bottles and cans in it? Cardboard and felt pen to the rescue. 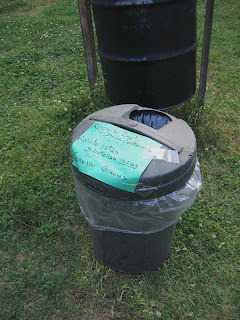 The second photo shows another, more weather resistant way to convert a trash can to a recycling container. Simply cut a hole in a plastic lid and add a small laminated sign. Note that it's paired with a trash can. Otherwise, people would be tempted to throw trash in it, despite the small size of the opening. As far as I know, there is no manufacturer of this simple recycling retrofit for trash cans. Makers of trash cans do not sell lids separately, much to the disgruntlement of hardware store owners, who find that lids tend to disappear from their shelves, leaving them with lidless trash cans they can't sell. The Princeton Environmental Commission's second annual Green Home and Garden Tour is this coming Saturday, November 15, from eleven o'clock till four. Simultaneously, Hopewell Township's Environmental Commission will hold its first "Greener Living" tour. This year's tour-goers can see twice as many examples of living sustainably. Last year's Princeton tour won a 2008 New Jersey Environmental Achievement Award. The two free, self-guided tours will feature area homes, gardens, commercial buildings, and a school. Together, they demonstrate the major kinds of environmental sustainability recommended by the U.S. Green Building Council through its LEED standards (Leadership in Energy and Environmental Design). The tours are designed not only to show area residents practical ways to live sustainably. They are also intended to forward our area's economic sustainability by showcasing the local architects, builders, suppliers, and landscapers who can help tour-goers realize their environmental goals. Maps allowing you to take these tours can be downloaded soon at www.princetontwp.org and at www.hopewelltwp.org. Now is a good time of year to consider ways to reduce water use. Your sewer bill, which you pay through your property taxes, is calculated each year from your winter water bill. The logic is that, since you aren't watering your lawn in the middle of January, all the water you use in winter goes down the drain. A winter bill, therefore, provides a good measure of how much water you're sending to the wastewater treatment plant year-round. If you reduce your winter water bill, you will save for the next year on your sewer bill. So, for instance, if you've been meaning to buy a low-flow toilet, put aerators on your faucets, or get a low-flow shower head, now's as good a time as any. If you don't want to replace all the toilets, just replace the one that gets the most use. Designs have improved so much that a water-efficient new toilet works far better than the old water-guzzling varieties. Consumer Reports compares some models. I've heard Eljers are good, and Toto, too. Toto has a 1.28 gallon E-Max model that is excellent. I'm sure there are many others that work well. Gravity flush is more than sufficient. No need for pressurizing chambers, etc. Another way to save on water bills, and heating as well, is to adjust your water heater so that the water is just the right temperature for a shower. This makes for much less fiddling with hot and cold during showers, and makes it easy to adopt the "navy shower" approach (http://en.wikipedia.org/wiki/Navy_shower). Maybe we should call it an "energy security" shower. The energy "vampires" in your house, those appliances that draw electrical power even when turned off, include your central air conditioner. There's a small heating unit in the compressor that keeps the crankcase oil warm. I checked with someone at Redding, and was told that there is no need to have this function turned on during those months when the A/C is not in use. To prevent this energy loss, simply trip the circuit breaker that's dedicated to the A/C, so that it is off through fall, winter and spring. Push the circuit breaker again as hot weather approaches, to allow it to warm up again before use. Saves about $10/year. "Yes, it is true that there is a "sump" heater that keeps the freon oil warm. I actually flipped off both my compressor breakers last week at home for that very reason. Just be sure to turn it back on a day or so before you actually want to run the air conditioner so you don't push oil through the lines." I discovered this by using a T.E.D. whole house energy monitor, which tells me how much energy the house is using at any moment. The trick is to try turning everything off in the house. If some energy is still being used, then try turning off one circuit breaker at a time to see where the mysterious energy drain is coming from. This led to the discovery of the A/C's vampire nature, confirmed by a call to the A/C repairman.